Already using IntenseDebate? Sign In Here. 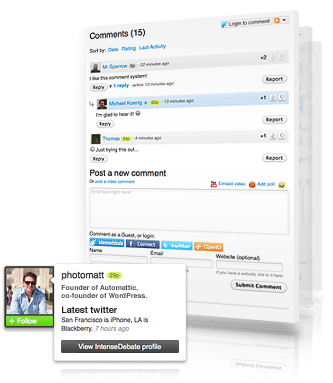 IntenseDebate is a feature-rich comment system for WordPress, Blogger, Tumblr and many other blogging/CMS platforms. Give your readers the tools to engage in interesting discussions around your content. With IntenseDebate comments can be posted using Facebook Connect and Twitter accounts. 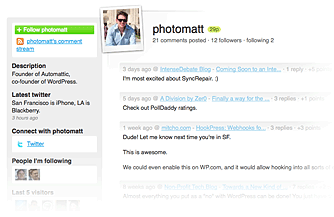 Innovative discussion tools make for easier and more fun conversations on your blog/website. Email notifications bring previous commenters back to your site to continue the discussion, boosting your page views. Click the tabs to learn more! IntenseDebate email notifications alert you and your readers of new comments, encouraging return visits and additional commenting. You can reply to and moderate comments via email, while threading makes it easy to follow the conversation. Threading: Reply directly to a specific comment with nested replies. Email Notifications: Receive alerts for replies and new comments. Reply-By-Email: Respond to and moderate comments via email. View details on the Features page. Enable your users to see who they're debating with. Rich profiles and the ability to connect with people makes IntenseDebate a very useful widget. Commenter Profiles: Give your readers' voices an identity! Reputation Scores: Get a quick overview of a commenter's history. Comment Voting: Bring the best comments to the front. Comment History: Keep track of all of your comments. Easily handle moderation and spam control. Moderation: Auto-filter comments by keyword, email and IP addresses. Blacklisting: Auto-delete comments by keyword, email and IP addresses, or ban users from posting. Spam Filters: Akismet keeps the spam at bay. Multiple Admins: Assign additional admins to manage the same blog/website. Let your readers post comments using services like Facebook and Twitter. They can also sign up for an IntenseDebate profile or simply comment without one as a Guest. Facebook Connect: Comment using your Facebook profile. Twitter Sign-In: Post with your Twitter account and tweet your comments. Gravatar: Full integration with your Gravatar profile. Online Identity: Get to know your readers and let them connect with each other. Guest Commenting: Post without an account.